So, as you know, it's my mission to be bothered. To make effort and be more intentional with my life. One of the main things that statement relates to is getting in the kitchen. I actually really enjoy cooking, but I'm put off by long hours at work, being tired when I get home and generally being a bit lazy sometimes. 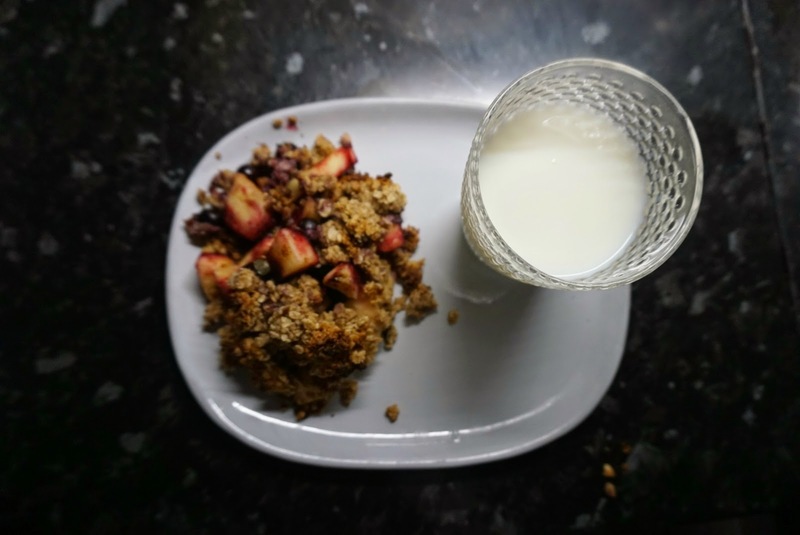 My hitlist of things to focus on in April included easing up off the sweet treats (read: chocolate), and I've been doing just that using Deliciously Ella's Banana and Cinnamon crumble as a base. 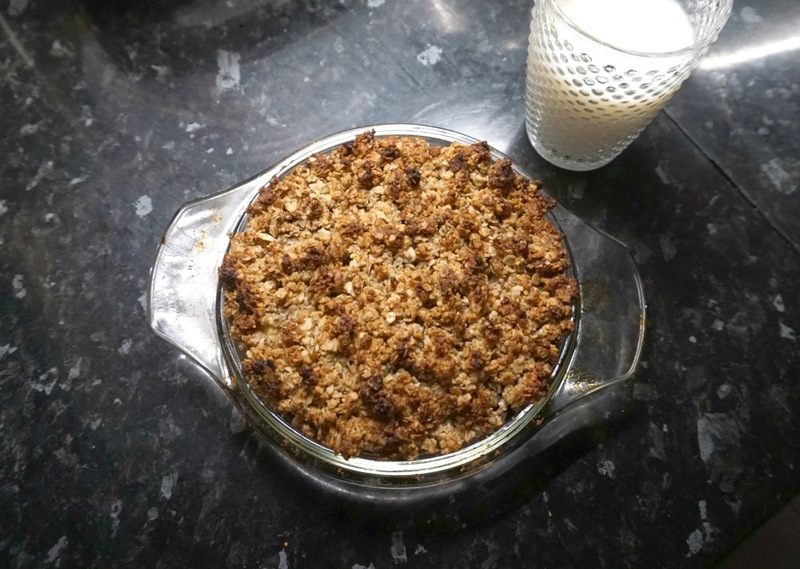 The crumble topping is the best thing I've tasted in a long time. And the fact that it's only made of four ingredients and no processed sugar is just beyond me. Oats, coconut oil, agave nectar and pecans (I omit the almonds out of personal choice). I've been experimenting with the original recipe and quantities as I need to keep them small so I don't eat it for breakfast, lunch and dinner! 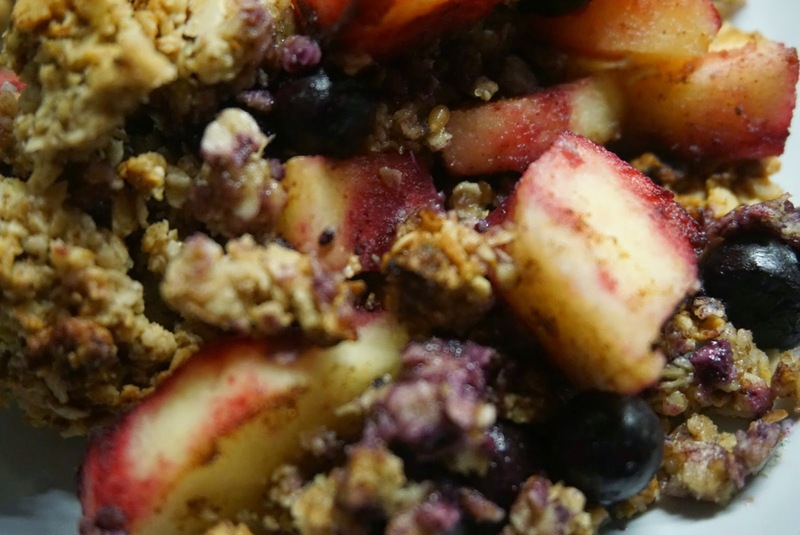 So today, I give you the apple & blueberry crumble with ginger and seed crumb (insert drooling emoji here). The great thing I love about this recipe is that it's so versatile, contains no processed foods and most of the bits you'll have in the cupboard from all those times you promised yourself you'd make juices and protein balls... it's not just me right? Step one. Blend the pecans, ginger and seeds to make a rough flour. I used the grinding tool on my Nutribullet. Step two. Pop the coconut oil and agave nectar into a microwave safe bowl and pop into the microwave for about 20 seconds, until the oil melts. Step three. 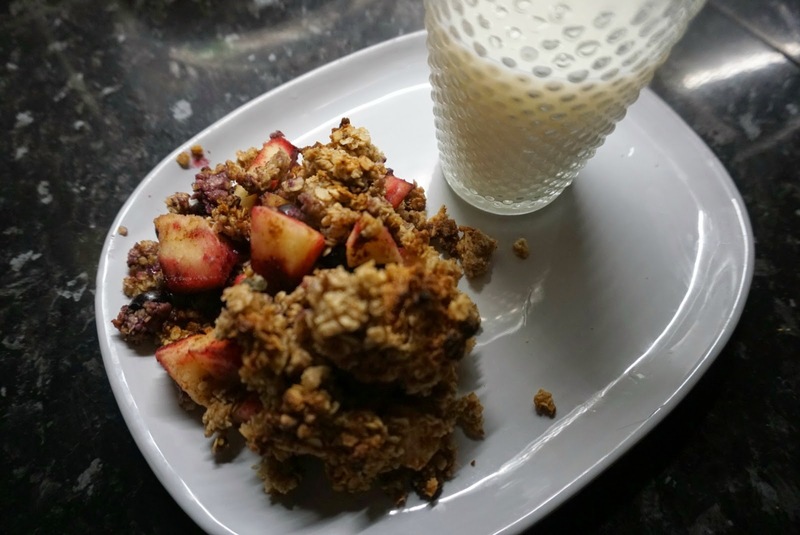 Combine the nut flour, oats and coconut agave mix to form your crumble. Step four. Chop the apple into bitesize pieces and place into a small oven proof dish. Add the blueberries and sprinkle the spice over the top of the fruit. Step five. Evenly distribute the crumble mix over the fruit mix and it's ready for the oven! Step six. Bake for 17-20 minutes on gas mark 5 until golden brown. Trying not to undo the health benefits, I've been having mine with a cuppa. Or milk or yogurt instead of reaching for the ice cream. I've also been having leftovers for breakfast. I mean, oats, fruit - it's practically cereal! I want to get a few portable tubs, so I can take it to work for those weak moments that lead me to the shop over the road for emergency chocolate fixes. I'm already thinking of the next variations! Some sort of concoction involving coconut shavings needs to happen and I also want to try a mandarin and cacao version. I'll keep you updated! Let me know if you try it!